Sergey A. Moiseev was born in 1957 and graduated in Kazan State University (1979 with honors). He defended his Ph.D. “Phasematching at the generation of optical fields in crystals with phase memory” in 1987, and a further Dissertation (Habilitation) “Time-delayed interference at the nonlinear interactions of light with matter” for the degree of Doctor of Physical and Mathematical Sciences (D. S.) in the field of coherent and quantum optics in 1999. Moiseev has published more than 100 scientific papers in the field of modern optics and spectroscopy in the journals of Russia, S. Korea, Europe, and USA. In 2001, S.Moiseev had proposed photon echo quantum memory [S.A.Moiseev, S.Kroll. PRL. 87, 173601 (2001)] that has gained the worldwide recognition, and several record results have been achieved on its basis in the experiments of Australian, Switzerland, Swedish, Canadian, and French laboratories (2009–2013). In 2010 S. Moiseev, together with S. Andrianov and F. Gubaidullin (Russia) adopted the photon echo quantum memory into the optimal cavity. The improved properties of this scheme have been confirmed recently [M. Sabooni, et al. Phys. Rev. Lett. 110, 133604 (2013)]. In 2011-2013, he has proposed new efficient photon echo quantum memory schemes on the atoms with natural inhomogeneous broadening and has demonstrated possible applications of such quantum memory for deterministic manipulation of quantum light. In 2013 he together with S. Andrianov and E. Moiseev (Russia) has proposed quantum computer based on realization of two-qubit operation in a scheme of atomic quantum transistor. In 2006-2007, he had proposed four wave mixing schemes for stationary light pulse that has been confirmed experimentally [Yen-Wei Lin et al PRL 102, 213601 (2009)]. Now this approach for controlling stationary light pulse is under intensive study. I had predicted a muon spin echo detected later together in Rutherford Laboratory (UK, 1998) and predicted time delayed single-photon quantum interference in photon echo media (1993–1997), which was demonstrated experimentally by S. Kroll et al. (Sweden, 2003). He had also predicted single-photon echo (1997) that was confirmed theoretically by S. Hartman and R. Friedberg (USA, 1999). In 1987, Moiseev had solved a well-known problem of photon echo irradiation in optically dense medium that was solved for weak light pulses in 1972 by E. Hahn et al. and S. Hartmann et al. (USA). S.Moiseev coauthored, alongside B. Sanders and A. Kamli (S. Arabia), the USA-Canada patent (No. US 8,264,759 B2, Sept 11,2012) on the Fast all-optical switch. Along with J. L. Le Gouët (France), Moiseev is a Guest Editor of Special Quantum Memory Issue in Journal of Physics B: Atomic, Molecular and Optical Physics (July 2012). S.A.Moiseev worked as a Visiting Researcher at the Lund University (Sweden 2000-2001), as Visiting Professor (Brain Pool Program grant) at the Inha University, Incheon, South Korea (2004, 2005-2006), a Visiting ICORE Researcher Professor at Calgary University (Canada 2008, 2010), Researcher Professor at Universite Paris-Sud (France 2011), Researcher Professor at Jilin University (China 2014) . 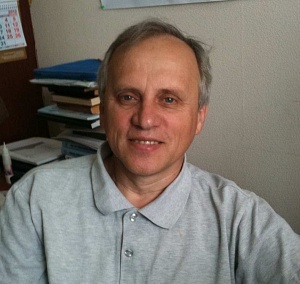 From 2005, S. Moiseev is a referee of the following journals: Phys.Rev.Lett., Phys.Rev.A, New J. of Phys., Journal of Physics B, Optics Express, J. of Quantum Information, Optics Comm., Physics Letters, Eur. J. of Physics, Canadian J. of Physics, Int. J. of Theor. Phys., Physics Scripta, Journal of the Physical Society of Japan. Moiseev S.A., Gubaidullin F.F., Kirillov R.S., Latypov R.R., Perminov N.S., Petrovnin K.V., Sherstyukov O.N. Multi-Resonator Quantum Memory Accepted to Phys.Rev.A. 2017. Narkis M. Arslanov, Ali A. Kamli, Sergey A. Moiseev A transversely localized light in waveguide: the analytical solution and its potential application Laser Physics 27, 025103 (5pp) (2017). N. S. Perminov, R. S. Kirillov, R. R. Latypov, S. A. Moiseev and O. N. Sherstyukov Optimal conditions of quantum memory for spatial frequency grating of resonators Bulletin of RAS: Physics – 2017, Vol. 81, N. 5. С. Н. Андрианов, С. А. Моисеев, Нанофотоный квантовый компьютер на основе атомного квантового транзистора, Квантовая электроника Т 46, № 10, с. 937-941 (2015). Agus Muhamad Hatta, Ali A. Kamli, Ola A. Al-Hagan, and Sergey A. Moiseev.Slow light with electromagnetically induced transparency in cylindrical waveguide. J. Phys. B: At. Mol. Opt. Phys. 48, 155502 (2015); arXiv:1412.5742v2 [physics. optics]. S. A. Moiseev, V. A. Skrebnev. Symmetric pulse sequence for dynamical decoupling of local fields and dipole-dipole interactions. J. Phys. B: At. Mol. Opt. Phys. 48, 135503 (2015). K. I. Gerasimov, S. A. Moiseev, V. I. Morosov, and R. B. Zaripov. Spin frequency comb echo memory controlled by a pulsed-gradient of magnetic field. SPIE Vol. 9533, 953310 (1-8) (2015). S. A. Moiseev, V. A. Skrebnev. Short cycle pulse sequence for dynamical decoupling of local fields and dipole-dipole interactions. Phys.Rev.A. 91, 022329 (2015). S. N. Andrianov, and S. A. Moiseev Magnon qubit and quantum computing on magnon Bose-Einstein condensates, Phys. Rev. A. 90, 042303 (2014); S.N. Andrianov, and S. A. Moiseev, Magnon qubit on double Bose-Einstein condensate. arXiv: 1202.3057v1 [quant-ph]. K. I. Gerasimov, S. A. Moiseev, V. I. Morosov, and R. B. Zaripov. Room-temperature Storage of Electromagnetic Pulses on High Finesse Natural Spin Frequency Comb, Phys. Rev.A. 90, 042306 (2014). S. N. Andrianov, V. V. Bochkarev, and S. A. Moiseev, Kinetics of pulse induced magnon Bose-Einstein condensate. The European Physical Journal B 87, 128 (2014). S. A. Moiseev, A. I. Sidorova, and B. S. Ham, Stationary and quasistationary light pulse in three-level cold atomic system. Phys. Rev. A. 89, 043802 (2014). С. А. Моисеев, С. Н. Андрианов, Е. С. Моисеев Квантовый компьютер в схеме атомного квантового транзистора с логическим кодированием кубитов. Оптика и спектроскопия 2013, том 115, № 3, с. 406–414. F. M. Ablayev, S. N. Andrianov, S. A. Moiseev, A. V. Vasiliev Quantum computer with atomic logical qubits encoded on macroscopic three-level systems in common quantum electrodynamic cavity. Lobachevskii Journal of Mathematics 2013 Vol. 34, No. 4, pp. 291–303; arXiv: 1301.2201v1 [quant-ph], 10 Jan 2013. J.-L. Le Gouët, and S.A. Moiseev, Quantum memory, Journal of Physics B: Atomic, Molecular & Optical Physics. 45, 120201 (2012).
. S. A. Moiseev, and S.N. Andrianov. Photon echo quantum random access memory integration in quantum computer, Journal of Physics B: Atomic, Molecular & Optical Physics 45, 124017 (9pp) (2012); arXiv:1201.4487v1 [quant-ph]. M. Bonarota, J.-L. Le Gouët, S. A. Moiseev, T. Chaneli`ere. Atomic Frequency Comb storage as a slow-light effect. Journal of Physics B: Atomic, Molecular & Optical Physics 45, 124002 (2012); arXiv:1112.0338v1 [quant-ph] 1 Dec 2011. S. N. Andrianov and S. A. Moiseev “Quantum computers on multiatomic ensembles in quantum electrodynamic cavity” Opt. and Spectr. 112, 394 (2012); С.Н. Андрианов и С. А. Моисеев, Квантовые компьютеры на многоатомных ансамблях в квантово электродинамическом резонаторе, Оптика и спектроскопия, том 112, № 3, с. 436–443 (2012). S. A. Moiseev, A. A. Kamli, and B. C. Sanders, Fast All-optical switch, United States Patent. No. : US 8,264,759 B2, Sep. 11, 2012.
. S.A. Moiseev, Photon-echo quantum memory with complete use of natural inhomogeneous broadening, Phys. Rev. A 83, 012307 (2011); Импакт фактор = 3.023. http://journals.aps.org/pra/abstract/10.1103/PhysRevA.83.012307. Sergey A. Moiseev, Sergey N. Andrianov, Eugene S. Moiseev. Atomic quantum transistor based on swapping operation. arXiv:1108.6156 (2011). F. M. Ablaev, S. N. Andrianov, S. A. Moiseev, A. V. Vasiliev. Encoded universality of quantum computations on the multiatomic ensembles in the QED cavity. International Conference on Quantum Technologies, 2011, Moscow. – 2011. – p.89.
. Farid Ablayev, Sergey N. Andrianov, Alexander Vasiliev, and Sergey A. Moiseev Quantum Computing on Multi-atomic Ensembles in Quantum Electrodynamics Cavity, arXiv:1111.3133v1 [quant-ph] 14 Nov 2011. S. A. Moiseev, S. N. Andrianov, and F. F. Gubaidullin. Solid state quantum computer of waveguide circuit architecture. Laser Physics (2011), Vol. 21, No. 8, pp. 1503–1510; arXiv:1009.5771v1. ; S. A. Moiseev, F. F. Gubaidullin and S. N. Andrianov. Solid state quantum computer of waveguide architecture. arXiv:1009.5771v1; S. A. Moiseev, F.F. Gubaidullin and S.N. Andrianov. Quantum computer of wire circuit architecture, ArXiv: 1001.1140v2 (2010) [quant-ph]. A. A. Kamli, S. A. Moiseev, and B. C. Sanders, Quantum informatics with plasmonics metamaterials, International Journal of Quantum Information, Volume: 9, Supplementary Issue 1 pp. 263-279 (2011), DOI: 10.1142/S0219749911007277. N. T. Valishin, F. T. Valishin, and S. A. Moiseev, Trajectory-wave approach to electron dynamics in hydrogen atom, (2011) arXiv: 1102.1654v1 [quant-ph].
. S.A. Moiseev, S.N. Andrianov, and F.F. Gubaidullin. Efficient multi-mode quantum memory based on photon echo in optimal QED cavity, Phys. Rev. A 82, 022311 (2010); ; arXiv:1001.1140v1, (7 January 2010). S. N. Andrianov, S. A. Moiseev, Fast and robust two- and three-qubit swapping gates on multi-atomic ensembles in quantum electrodynamic cavity, Proceedings of Workshop on High Productivity Computations (HPC 2010).EPTCS (Eds. : F. Ablayev, B. Coecke, A. Vasiliev) V. 52, 2011, pp. 13–21, doi:10.4204/EPTCS.52.2. Арсланов Н. М., Моисеев С. А. Kamli A. Слабозатухающие поверхностные поляритоны в цилиндрическом волноводе из метаматериала// Когерентная оптика и оптическая спектроскопия: XIV международная молодежная научная школа. – Казань: Казан. ун-т. 188-191 cc. 2010. Васильев А. В., Арсланов Н. М., Аблаев Ф. М., Моисеев С. А. Реализация квантового алгоритма вычисления функции MODm в оптической схеме // Когерентная оптика и оптическая спектроскопия: XIV международная молодежная научная школа. – Казань: Казан. ун-т. 192-195 cc. 2010. Y. Chen, S. A. Moiseev, and B. S. Ham, “Multi-color Stationary Light,” Book Chapter 26 in Advances in Lasers and Electro optics, Editors Nelson Costa and Adolfo Cartaxo, India, 617-632 pp. (2010) IN-TECH, ISBN 978-953-307-088-9. Н. М. Арсланов, С. А. Моисеев, and A. Kamli. Слабозатухающие поверхностные поляритоны в планарном волноводе из метаматериала, Материалы 5-й Международной научной школы «Наука и инновации – 2010″, ISS “SI-2010”: 19 июля – 24 июля 2010 г. Йошкар-Ола, 2010, C.45-49.
. S. A. Moiseev, A. A. Kamli, and B. C. Sanders. Low-loss nonlinear polaritonics, Physical Review A 81, 033839 (2010).
. K. -P. Marzlin, Z. -B. Wang, S. A. Moiseev, and B. C. Sanders. Uniform cross phase modulation for nonclassical radiation pulses, Journal of Optical Society of America B, 27, № 6, A36-A45 (2010).
. S. A. Moiseev and E. S. Moiseev. Multi mode nano scale Raman echo quantum memory, in the book of the NATO Workshop: “Quantum Cryptography and Computing” (R. Horodecki, S.Ya. Kilin, J. Kowalik (eds. ), IOS Press, Amsterdam, 2010, p.212-223); arXiv: 1002.0147v1 [quant-ph] 31 Jan 2010.
. Н. М. Арсланов, С. А. Моисеев. Многомодовая квантовая память на фотонном эхе в среде с продольным неоднородным уширением линии, Ученые записки Казанского университета, Изд-во Казанского университета, Казань, 152, № 3, 27-37 сс. (2010).